I’ve been meaning to overhaul the look of this blog for awhile now, and I’ve finally been playing around with my blog layout and header image today, kittens. I know chevrons are really trendy and overdone at the moment…but darn if I do not love the look of them. Thanks to this nifty Photoshop tutorial, I was able to make my own this morning. I’m not 100% sold on how I did my new header…a graphic designer I am not. I was going for something more simple but still crafty. I love interesting fonts, but sometimes they are too hard to read. (But at least I didn’t use Comic Sans or Papyrus, amirite?!) What do you think? Not A Podcast: Episode 11 from SewKnitpicky on Vimeo. This one got away from me, kittens. I recorded late in the day and then was too busy to type up show notes until about bedtime. Keeping them short and sweet this week. I had issues getting words out of my mouth, both on Sunday and today…not sure what was going on there. I haven’t had that many issues in awhile. ♥ Birthday Owl– this was very well received. ♥ Not even thinking about it at this time. So much to do with my current projects! Not A Podcast: Episode 9 from SewKnitpicky on Vimeo. Again, with the pissed off face*. I think Vimeo is trying to make me look as unpleasant and crazy as possible! One things these podcasts have taught me: I have a very animated style of talking. My goodness. Another short one this week, kittens. *Though, I will say this: I *should* have a pissed off face since a lot went wrong this week…including losing the video editing software I had and I could not get back. My whole computer had to be wiped and the OS re-installed So I downloaded a trial. It chopped everything to 3 minutes and I didn’t realize it until I went to make this post. OH, all the negative feels that ensued from that! So I gave in and bought the software and had to put this post up much later than I had been expecting to. At least this week’s video was easy to redo, having been done in a single cut with no real edits to speak of. This has been my week. 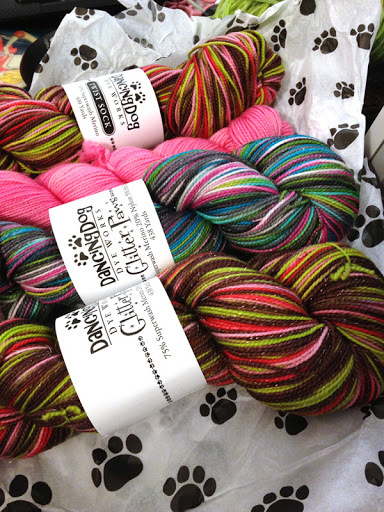 ♥ This wasn’t part of the show because it showed up after I filmed, but here’s some more Dancing Dog Dye Dyeworks that I pre-ordered last month. An audible squeal may have escaped me when I opened this. And I may have startled The Boy when I did so. Yeah, I’m totally winning Mother Of The Year today. Welcome to my second monthly post in Kitten‘s Pinterest Along! This month, I actually tried out a few new things that I had pinned on Pinterest. Are you all on Pinterest, kittens? I love it; you can find me there as Sew Knitpicky. Visual bookmarking is the bee’s knees as far as I’m concerned. I’m jealous that I didn’t think of it first. Let’s start off with a Pin that went very well. I am all thumbs when it comes to doing my hair. 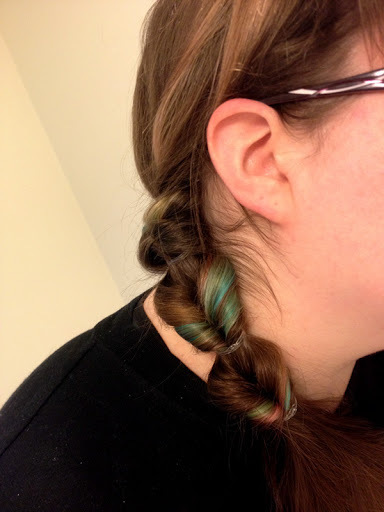 I apparently missed the memo about the day when I would acquire the dexterity and coordination needed to do even the most simple things… like French braiding, working a curling iron…anything more difficult than a simple traditional braid or brushing my hair, really. Add to that the fact that my hair has serious Speshul Snoflake syndrome and well…let’s just say I wear it back in pony tails most of the time. * I have an entire Pinterest board dedicated to ideas of how to handle my hair and try to fake looking like I know what I’m doing, but sadly, most are too complex for me to manage at this point in time. So imagine my shock and delight when I watched through this video a friend of mine Pinned and I realized that no special tools were used to make those hairstyles! No irons. No teasing sessions. No sprays. No turning upside down or trying to execute maneuvers best left to Indian deities and their many hands. In most cases they require hair elastics and maybe bobby pins if they’re buns. WIN. I love that it has a similar feel to a fishtail braid, but it much more simple to execute. This style took me about 5 minutes to do…with a couple of restarts because my hair was refusing to cooperate. It’s chilly but very humid here thanks to Sandy**, so my hair’s hackles are raised. I can not wait to try more of the styles from this video! *My hair is baby fine but I have tons of it. It has the right texture to curl but won’t [it’s baffled several stylists now]…unless it’s the ever-short hairs in the very front of my head and then they curl into cork screws at the very worst times [I seriously rock the CRAZY look more often than I would like to admit…I look frazzled when it happens]. If it’s long, it goes limp. If it’s short, it does this crazy poofy thing and even tries to curl upwards. I will not start on all of the cowlicks it contains, or the fact that no perm can tame it. The texture is so fine that man-made intentional curls fall right out. But yes, HOT MESS would very accurately describe my mane. In my fantasy world in which we win a vulgar amount of money in the lottery, I have someone to do my hair for me every day and I never look like a slob again. I dream big. ** Sandy has passed since I started writing this post. My food Pins that I tried out were pretty successful as well! Two from The Prime Pursuit–Lara Balls and the Chocolate variety (minus the coffee)–went over extremely well Chez Knitpicky. They are full of fiber and pretty sweet as-is. I added a half teaspoon of honey to each recipe to sweeten them up just a tiny bit more. I found it pretty amusing that my son–like PP’s neighbor–mentioned that the original kind reminded him of cookie dough. Too funny! I bought supplies to make more of these for home, and I think that if I go to any get-togethers in the coming months, I’ll make some for those. I’m pretty sure no one will complain about a filling, healthy treat. Another winner this month was Pennies on the Platter’s DIY Homemade Hot Chocolate Mix. The only change I made was a touch more sugar, because I used 70%+ dark chocolate in mine instead of white chocolate chips. This is so yummy when you use milk to make it. Sadly, mixing with water makes it taste like any old cheap packet mix. We’re going to head home for Giftmas this year, and I think I may make up a double or triple batch of this to give away as gifts. Simply Love Food’s Southwestern Stuffed Peppers were NOM NOM NOM. Other food pins were OK, but require further tweaking to be GREAT! In this category would be Lizzy Write’s Korean Beef. It was tasty and I wanted to love it, but it was just a bit too salty for my tastes and it needs something…more. (This may be due to the fact that I do not have low sodium soy sauce, nor do I care overly much for green onions so I left them out that day. I’ll probably remake this in the future and then report back at that time.) It was also pretty sweet; I would likely cut that a big when I remake this. Even as-is, I would eat it again, but I wouldn’t be raving about it. Crock Pot Beef Stew was also in this category. It was edible, but I really didn’t like the tomato based “stew.” My children weren’t too hot on this one either. I’m not sure I would try to fix this one though; I think I’ll let it go to try another recipe more to our tastes. I think that covers my last month of Pins pretty well! I hope everyone else was as successful.